Video surveillance as a service (VSaaS) refers to hosted cloud-based video surveillance. The service typically includes video recording, storage, remote viewing, management alerts, and cybersecurity. The video processing and management are performed offsite using the cloud, though the VSaaS system may have a simple onsite device to communicate with the cameras and the cloud, acting as a communications conduit. Video surveillance as a service by Application (Infrastructure, Commercial, Residential, Industrial, Institutional, Others), by Service (Hosted, Managed, Hybrid) & Geography..
Video surveillance as a service (VSaaS) refers to hosted cloud-based video surveillance. The service typically includes video recording, storage, remote viewing, management alerts, and cybersecurity. The video processing and management are performed offsite using the cloud, though the VSaaS system may have a simple onsite device to communicate with the cameras and the cloud, acting as a communications conduit. The global VSaaS market is estimated to grow with 20.77% CAGR during the year 2019 – 2027. The base year considered for the study is 2018 and the estimated period is between 2019 and 2027. The increase in demand for real time access. The complexity of cabling is reduced by I.P. cameras and VSaaS. The most important driver is the declining prices of I.P. cameras. The prices of security solutions, such as IP cameras, are quickly dropping and with a new array of technologies, there is no need of an internal server to store the camera data as it will be stored in the cloud. This will make it easier and cost-effective to install security solutions. Earlier, companies had to hire security guards to constantly monitor their premises. Several companies are cutting down on the number of security guards and switching to security services, in which a third party is alerted whenever there is suspicious activity. This, in turn, cuts down on costs and false alarms. As vendors of security solutions come up with better surveillance technology and attract more customers, there will be a further decline in the price of the security solutions. Thus, security products will also become an option for the common house owners along with big companies. The decline in the price of video surveillance is expected to drive the VSaaS market. The largest segment by the application is infrastructure. Now more than ever, countries across the world are facing the potential of high-level threats due to escalated terrorism and global adversity. Critical infrastructure sites, essential for the functioning of society and the economy, are the most vulnerable. Facilities for electricity, oil & gas, telecommunication, water supply, agriculture, transportation, financial services, police and military are all potential targets for attack. They require specialist physical security and surveillance applications to mitigate events that could incapacitate or destroy these vital systems and assets and have a debilitating impact on physical and economic security and public health and safety. The traditional analogue systems have various problems such as data storage problems, data damage problems and limited space. But on the other hand, the IP cameras and VSaaS technology solve these problems for the highly critical areas as these. Due to these factors, the infrastructure has the largest market share. The restraints and challenges of the VSaaS market are slow internet speed, lack of common standards that cause integration issues, growth in fear for privacy, low awareness about the market, and privacy and security concerns for the data collected. The important restraint in growth is the fear of privacy. A surveillance system monitors every activity of the location where it is installed. Moreover, continuous deployment of advanced and sophisticated information gathering coupled with access control technologies are done in a surveillance system. This continuous improvement in surveillance system may create privacy concerns among citizens. This issue is more specific to countries where laws regarding privacy protection are applicable such as America, Europe, Middle East and Africa. To reduce the effect of these restraints, residents should be educated about the benefits of the surveillance system. Thus, the privacy concerns will largely affect the VSaaS market. Video surveillance as a service Europe Market – United Kingdom Germany, Italy, France, Russia, Spain, Rest of Europe. Rest of World – Latin America, Middle East & Africa. The Asia Pacific is the largest and the fastest growing region. Trends of the past three years reflect the growth of the video surveillance industry in the Asia Pacific region. 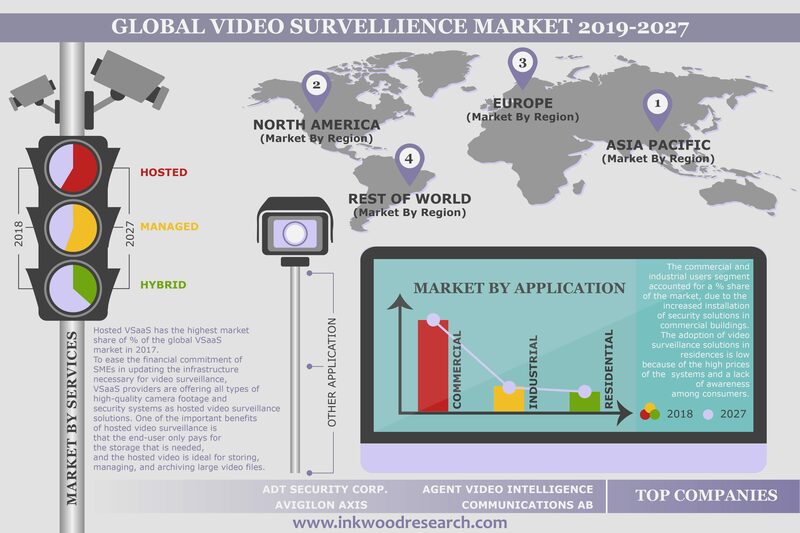 The rising crime rate, terrorism and threats from external intruders entering illegally in the countries, along with the increasing security needs, are some of the factors driving the growth of video surveillance in the Asia Pacific. The expanding infrastructure in China and India has provided a significant push to the growth of video surveillance in these regions. The declining cost of the overall CCTV-based security system package due to the reduction in the prices of video cameras has hiked the price competitiveness, especially in the Chinese, Indian, and South Korean market. The growth of the surveillance systems has a direct relation to the growth of the VSaaS market. Thus, the growth in surveillance systems will increase the adoption of video surveillance as a service. The global VSaaS market segmented into the market by application and market by service. The market by application is further subdivided into infrastructure, commercial, residential, industrial, institutional and others while market by service is further subdivided into hosted, managed and Hybrid. Company profiles cover analysis of important players. These companies are using organic and inorganic strategies for growth. For instance, in September 2018, the ADT security services announced a new strategic initiative with Amazon. The company will support the integration of Amazon’s new Alexa Guard feature with the ADT Pulse security system. In the same month, ControlByNet was chosen by Lenox Villas, a multifamily community in the Buckhead area of Atlanta, GA, to provide a cloud-based video surveillance solution. Lenox Villas is a great example of using the latest technology, including the cloud, to benefit the community. In June 2018, the Axis communication launched AXIS Guardian, which is designed to allow security service providers and alarm monitoring companies to offer an end-to-end managed service with remote monitoring. Key findings of the global VSaaS market. Declining prices of cameras propelling the growth of the VSaaS market. Privacy and security concerns is a major concern for the adoption of VSaaS technology. The retail sector has many application in video analytics and intelligent video surveillance. Demand for video surveillance in education institutions on the rise. RETAIL SECTOR HAS MANY APPLICATIONS IN VIDEO ANALYTICS AND INTELLIGENT VIDEO SURVEILLANCE. COMPLEXITY OF CABLING IS REDUCED BY IP CAMERAS AND VSAAS.